Verhoef is a specialist in the design, development and fabrication of aluminium freefall lifeboats (FFLBs) for both shipping and offshore applications. Hundreds of Verhoef lifeboats have been supplied to many international oil companies worldwide, from the Netherlands to New Zealand. Besides being the only manufacturer to create its lifeboats in aluminium, Verhoef is also unique in building its launching and recovery systems as a single unit. Therefore, Verhoef’s clients deal with a single supplier, which removes issues in testing and commissioning and ultimately saves the end users a lot of problems. 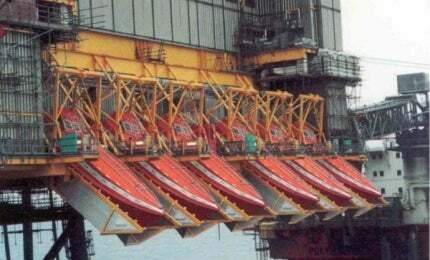 As well as being a pioneer in the design and manufacture of aluminium lifeboats, Verhoef has created more than 775 shore-based, access gangways to oil and gas terminals in 67 countries. Aluminium is renowned for its high-strength-to-weight-ratio characteristics, long life duration of more than 25 years and minimal required maintenance. It also offers the flexibility to manufacture lifeboats and gangways according to the specific requirements of Verhoef’s clients. These features are of great value not only for future projects, but also with regards to lifetime extension and retrofit projects, where existing platforms / jetties will be upgraded with new equipment, in accordance with the latest standards. Verhoef was founded nearly 75 years ago and has remained at the forefront of increasing safety at sea ever since. Verhoef remains a family-owned business and its CEO Martin Verhoef is proud of the company’s achievements. When the company celebrated its 50th anniversary in the early 1990s, Verhoef was awarded the highly coveted Golden Admiraal de Ruyter medal for its contribution to safety for all seafarers worldwide. The award is the highest safety award in the Netherlands and is only very rarely awarded to individuals or companies with a unique development or achievement. A prominent milestone in Verhoef’s history is the contract with Norwegian oil firm Statoil. The company was awarded a five-year framework agreement by Statoil to provide aluminium freefall lifeboat systems, as well as related products and support services. Verhoef’s award-winning track record has continued well into the 2000s and beyond, with 2011 bringing an achievement award, issued by one of the training institutes using its freefall lifeboat, which has been dropped more than 5,000 times with a 100% integrity rate. In addition, this achievement is entirely unique and underlines the quality and durability of the Verhoef freefall lifeboat. Verhoef has received an official certificate of Dunn&Bradstreet, the world's leading supplier of business information and insight. We are registered as a 'Rating 1' company, indicating the highest level of creditworthiness. VERHOEF, the Dutch builder of aluminum freefall lifeboats has now successfully performed full-scale tests with the first freefall lifeboat, powered by an electric motor.